Relax. No enchanted reindeer were harmed during the making of this snack. These are Rudolph potatoes, the red-skinned variety perfect for baking and roasting. 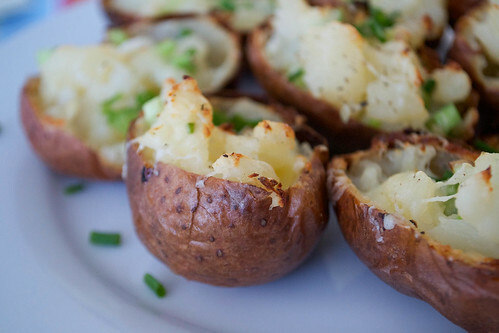 I've already talked about how I reckon they really do make the perfect roast potatoes, and so this time I decided to bake them, scoop out their fluffy insides and make loaded potato skins with them. We're going to have some for dinner on Christmas Eve, they're perfect with a blob of sour cream and scattered with snipped chives. Preheat your oven to 200ºC and get out a baking sheet. Wash the potatoes and dry them. Rub in a little of the olive oil into the skin of each potato and sprinkle with sea salt. Bake in the oven for about one and a half hours. You want the skin to be super-crisp. After they've had their one and a half hours, take them out (but leave the oven on) and cut them in half, using a clean tea towel or oven glove to protect your hands if they're too hot to handle. Scoop out the white, fluffy insides of the potatoes into a mixing bowl and place the empty, crisp skins back on the tray. Chop the spring onions and add to the bowl with the potatoes, along with the cubed cheese. Add a good pinch of sea salt and some black pepper and mix together. Spoon the potato mixture back into the skins and then finely grate a little extra cheese over the top. Slide back into the oven and bake for another 10 minutes or so, until the top of the potatoes are golden and the cheese has melted. 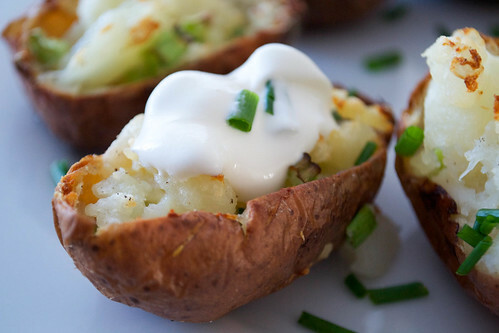 Serve straight away, scattered with snipped chives and with sour cream to spoon over as you eat. Thank you to Rudolph potatoes, who sent me the potatoes to cook with. ...and here's me thinking you'd loaded these with minced venison!!! Never heard of Rudolph potatoes!